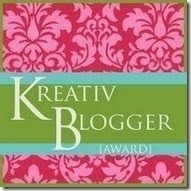 Joan from Mud Ranch (a VERY creative person) sent me the Kreative Blogger Award. I’m supposed to list my 7 favorite authors? Joan listed books, so I’m going to go with that. I don’t have as much time to read as I’d like. But, I can’t fall asleep without a little time with a book – or two. My nightstand always has a novel and at least three nonfiction books. Green Mansions by W.H. Hudson. I have loved this book since I was ten years old. I don’t know how many times I’ve read it. It’s a book that has continued to appeal to me for 50 years. Confederacy of Dunces by John Kennedy Toole. Funny and disturbing. Color in Spinning by Deb Menz. This book is always inspiring no matter how many times I pick it up. In Sheep’s Clothing by Nola and Jane Fournier. A really good reference book. Aw shucks – you guys are too kind. I’ll try to live up to being kreative. Funny, I’m not crazy about the K either. I think Joan is right – be default we are too practical. I got to meet Barbara Kingsolver and listen to her read from The Bean Trees right when it came out. WHAT A TREAT. She’s definitely in my top 7. I like Barbara Kingsolver too… Animal Dreams was a favorite in highschool and then I bought several after that. But seriously, no one but you is more CREATIVE nor deserving of any and all creative awards, be they blogger or no. And that list of books… good grief! You are lots of fun for such a studious and serious lady. I just love you! How’d the equine photos turn out?